As parents, we choose to serve meal to our family as healthy as possible that they would also enjoy the taste of a great meal. There are so many different ways to serve meal for the family, there are dry, soupy and just plain blah. This time I decided to cooked a dish or viand that I knew back in my hometown. This reminds me of my aunt and mother who used to cook meals for us. 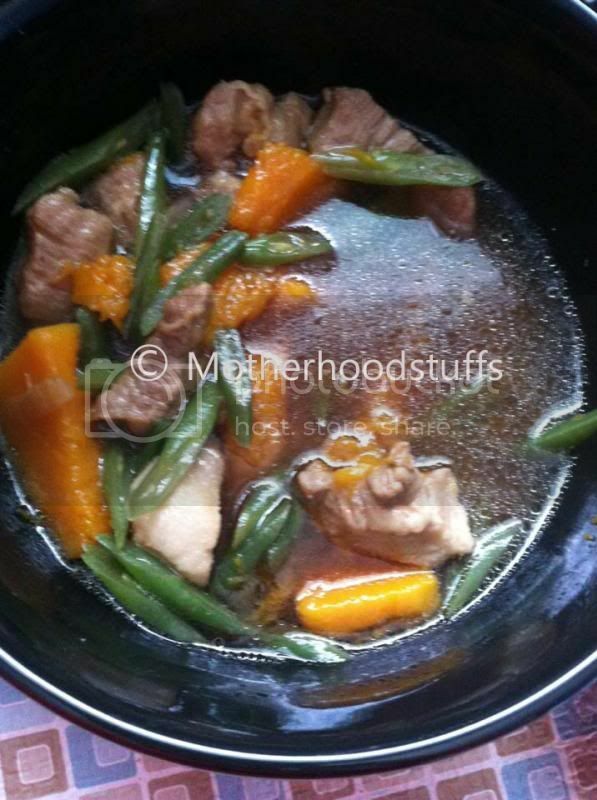 I have a butternut squash, green beans, and pork in one soupy dish. I of course put magic sarap spices to add more flavor. After less than hour or preparation, voolah!!! this is it. It taste really good, simple and healthy viand. Most important my 3-years-old loves the dish, although he isn't a big fan of the green beans, I mashed the butternut squash and mixed it on the rice and pure more soup plus the meat, he ate more than I can imagine. Chalap naman ng ulam na yan!